The Gap brand has cut key marketing and search advertising programs in the past year as it struggles to survive. The retailer beat analysts’ consensus for second-quarter earnings in 2018, but comparable sales for the Gap brand fell, while Old Navy and Banana Republic led the growth with 5% and 2%, respectively. Slumping sales show in its search marketing and advertising strategies. In 2018, Gap reduced by 95% the number of keywords it advertises on for women’s fashion. On New Year’s Eve 2017, the company competed on a mere 225 terms, and raised it to nearly 1,000 between January and mid-March 2018, before cutting investments again. 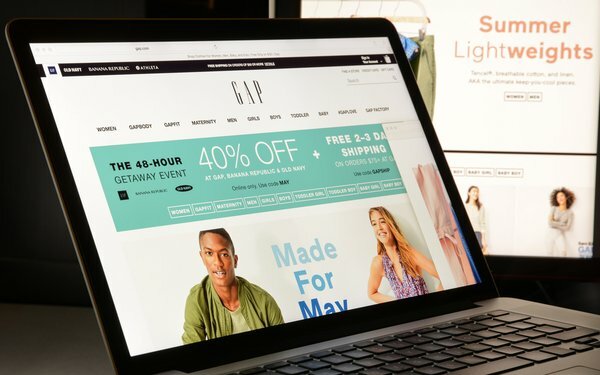 In just two months, from mid-March to mid-May 2018, Gap cut its search-term competition by 95%, from nearly 1,000 to 50. Investments began rising again slightly, but still only competes on 190 terms. The company within he past few months began dedicating the majority of its search campaigns to brand and sister brand terms, about 76%. The non-brand terms include “denim dress,” “women’s suits,” “sun dresses,” “womens suits” and “jumpsuit, but branded terms have been the main focus. Although Gap’s click share around its website was always relatively weak in terms of paid text ads -- reaching a high of 0.8% in early January -- the company’s click share fell to 0.1% in the women's fashion vertical at the end of May 2018, according to the data. Gap showed slight success and an uptick in product listing ad (PLA) click share during the past few months, jumping from just below 2% in December 2017 to 3% by the end of May 2018, with periodic spikes above 4% during that time. In the past 30 days, Jumpshot data shows similar trends in which the referring keyword “Gap” led 12.86% of search traffic to gap.com, followed by “old navy” at 10.92%, “banana republic” at 9.71%, and “gap kids” at 1.23%. Gap.com received about 33.51% of its referring domain traffic from oldnavy.com, 21.28% from google.com, and 3.11% from doubleclick.net, according to Jumpshot data.